More than a century ago, German psychiatrists such as Falkenhorst (cited in Vyleta, 2007) believed that feigners could be detected by observing the way individuals move. Today, some mental health experts still adhere to that idea. In a classic study, Rosenhan (1973) had eight individuals—Rosenhan himself, one psychology student, three psychologists, two physicians, and a housewife—admitted to psychiatric institutions. All of them claimed hearing voices during the intake procedure. Although they stopped complaining about hallucinations once admitted to the clinic, all of them were diagnosed with schizophrenia, were prescribed medications, and had to stay in the hospital for a considerable time. In 2004, Rosen and Phillips identified 12 studies in which normal people instructed to feign a condition were asked to visit a medical doctor. In all studies, physicians detected feigners at a very low rate, from 0% to 25%. Clinicians who do not use symptom validity tests will often fail to detect feigning of mental illness. As a consequence, they will think that only in rare cases will individuals pretend to have a psychiatric disorder. Just like the first misconception about feigning, this second myth also has old roots. Carl Gustav Jung wrote that, during his career, he spoke to thousands of people admitted to a psychiatric institution, and only 11 were feigners. German psychiatrist Többen also opined that feigning was rare. He studied files of patients admitted to the clinic where he was working, and reported that only two were pseudo-patients. Jung and Többen were not the only ones; many old German psychiatrists thought that feigning of mental illness did not occur. To a large extent, this belief was motivated by the fear of labeling truly sick people as malingerers, a practice present in the pre-19th century history of psychiatry. This fear is still with us today, and might explain why, in a study of 227 patients who attended the emergency department of a general hospital, 13% of them were suspected of feigning, while in their medical records this was completely dropped. Many case reports show that people are able to convincingly feign a disorder for a prolonged period of time. For example, Alan Knight not only pretended to be paralyzed and suffering from epilepsy; every now and then he would slip into a coma. He was caught when a CCTV camera spotted he and his wife shopping: Alan Knight was maneuvering a full shopping cart—not exactly skills that can be observed in a person living in an almost vegetative state. At the moment he was unmasked as a feigner, Knight had played the role of a paralyzed epileptic for two years. There are more examples of long-term malingerers. One famous case is Rudolf Hess, the high ranking Nazi official who first was held in captivity in England and later had to stand trial in Nuremberg. From February 1941 through February 1945, Hess claimed episodes of memory loss for vital parts of the recent German history in which he had played such a decisive role. Based on experiments that show that negative expectations may lead to decrements in performance on neuropsychological tests, it has been shown that if a clinician thinks a patient is severely ill, they will activate negative expectations in the patient’s mind, resulting in abnormal performance on symptom validity tests. There is evidence for a performance-undermining effect of negative expectations, but the effect is rather small. Speculating about “unconsciously determined distortion” may lead to circular reasoning: Because a patient is ill, she or he will score in the abnormal range on a symptom validity test, and because of this abnormal score on a symptom validity test, the patient must be ill. This circularity has been dubbed the psychopathology-is-superordinate fallacy—the belief that abnormal scores on symptom validity tests are both caused by psychopathology and prove psychopathology. The idea that mental health professionals should be kind to feigners builds on the notion that feigners are ill.
Not confronting feigners with their behavior may contribute to symptom escalation, as feigners may come to believe their lies. Pseudo-patients know that exaggerating symptoms conflicts with their self-definition of being an honest person – just as smokers often tell themselves that their chain-smoking grandfather reached the age of 92, feigners in the care of sympathetic professionals will start to believe that they do have real complaints. The belief that feigners have psychopathic or antisocial traits is a special variant of the idea that feigners are ill, but it also alludes to the myth that feigning is rare. Some high-profile cases seemed to confirm the close link between psychopathy and habitual feigning. A fine example is the story of Vincent Gigante, a mafia boss, who started to walk around the neighborhood dressed in his bathrobe and muttering in himself whenever he had to stand trial. Renowned experts testified that Gigante suffered from psychosis and vascular dementia, and PET scans were shown in court to bolster these claims. However, later, Gigante admitted that he faked his mental illness in order to avoid conviction. According to the bipolarity hypothesis, faking bad (fabricating or aggravating symptoms) and faking good (hiding symptoms) are two mutually exclusive categories. That is, people who feign are not expected to also engage in faking good. There is no solid evidence for this widespread idea; in the study mentioned above, the prisoners sample engaged in both feigning symptoms and faking good. The temporal patterns of faking bad and good testify as to the situational origins of feigning. During the pre-trial phase, defendants may feign mental illness and cognitive impairments in an attempt to reduce their criminal responsibility. Once convicted, these same individuals may engage in faking good so as to acquire privileges. Featured image credit: Hammer by succo. CC0 via Pixabay. Henry Otgaar works as Assistant Professor at the Forensic Psychology section, Faculty of Psychology and Neuroscience, Maastricht University. His research expertise revolves around issues such as the development of memory, false memory, the link between trauma, memory, and psychopathology, and memory in the legal area. He has published numerous peer-reviewed articles, book chapters, and books on memory (e.g., What Is Adaptive About Adaptive Memory?, OUP 2014). He has received many (inter)national awards for his research such as the Edmond Hustinx Science Award and the Early Career Excellence Award. He also works as an expert witness for the Maastricht Forensic Institute and is an associate editor for Memory and a co-editor for In-Mind. Mark L. Howe holds a Chair in Cognitive Science at City, University of London. His over 35 years of research on memory has addressed questions concerning memory development, memory illusions, the adaptive functions of memory, links between reasoning and memory, memory in traumatized and maltreated children, as well as memory and the law. He has published numerous peer-reviewed articles, book chapters, and books on memory development (e.g., The Nature of Early Memory, OUP 2011) and memory and the law (e.g., Memory and Miscarriages of Justice, 2017). In addition to editing a variety of books (e.g., Stress, Trauma, and Children's Memory Development, OUP 2008; What Is Adaptive About Adaptive Memory?, OUP 2014), he is the Associate Editor of Developmental Review and an Editor-in-Chief for Memory. 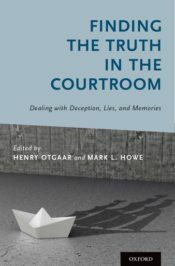 Together, they edited Finding the Truth in the Courtroom: Dealing with Deception, Lies, and Memories, published by Oxford University Press.